Australian Catholic Bishops Conference president Archbishop Mark Coleridge says it would be “naïve” to ignore the role the child sexual abuse crisis has played in a slight drop in Mass attendance figures in recent years. But Archbishop Coleridge said it is also important to consider other reasons affecting the number of people regularly attending Mass across the country. 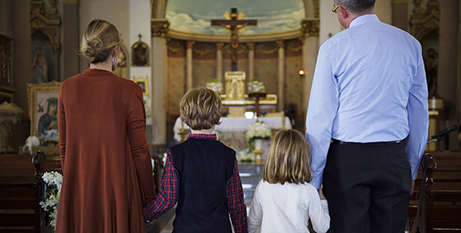 According to new figures from the National Centre for Pastoral Research, the percentage of the overall Catholic population that attends Mass regularly has fallen from 12.2 per cent in 2011 to 11.8 per cent in 2016. “There are many factors that could contribute to this drop in Mass attendance among those who tick ‘Catholic’ on the Census, but it would be naïve to assume the Church’s appalling failure in the area of child protection wasn’t among them,” Archbishop Coleridge said. Archbishop Coleridge said it’s also important to acknowledge the resilience and faithfulness of those who go to Mass regularly despite disturbing revelations and societal trends. “It can be a challenge for people to own their Catholic faith publicly these days, but 623,000 people were showing up each week in 2016,” he said. The National Count of Attendance has been carried out every five years since 2001 to coincide with the year of the national Census, allowing Mass attendance to be considered alongside nationally consistent data. It is the result of the average Mass count on four Sundays in May. It includes attendance at Masses in parishes, migrant Mass centres, hospitals, nursing homes, prisons, religious houses, university and other chaplaincies, and boarding schools, as well as Sunday assemblies in the absence of a priest. The 2016 Mass attendance figures could only be compiled when all 2016 Census data was released. A full report will be published later this year. Trudy Dantis, director of the National Centre for Pastoral Research, said analysis of the figures at a diocesan level can be difficult, because a range of factors – including people’s education level, country of birth and cultural connectedness – can affect the local attendance counts. “As with all research, we must be mindful of what the data tells us, but also what the data cannot tell us, including the causes of various changes in behaviour,” Dr Dantis said. Additional national demographic data from the 2016 Census regarding the Catholic population will be released later this week. More on the National Count of Attendance figures can be found on the NCPR website. This entry was posted in Uncategorized on April 2, 2019 by ACBC Communications. In Mark's Gospel, (Mark 16:15) we are instructed to "Go out to all the world and tell the Good News." This forum is designed to give analysis and news on issues effecting the Catholic Church in Australia and the world. The blog is an opportunity to reflect on stories in the media from a Christ-centered perspective, as well as present up to the moment information about the work of the agencies of the Bishops Conference. The authors of our blogs are Australian Catholic Bishops; lay and religious who work for agencies of the Bishops Conference and Communications professionals from around the Church in Australia. The public are welcome to comment on blogs and items which appear on this page, however these comments will be monitored strictly for content. Comments should reflect a commitment to Christian charity and be carefully considered before being posted. Only comments which are considered appropriate by the General Secretariat of the ACBC will be published. Correspondence will not be entered into.